It is an absolute privilege to be out here today - it is a day the likes of which I never want to forget. I am writing this blog update sat outside at the cockpit table, having just had an amazing lunch of caprese salad with serano ham served on our Oyster china plates at the table while Askari gently glides us across the ocean. We have about a metre of swell but it's so gentle the sea just looks like it is breathing. I just want to take in every minute of this day; it's just perfect. I just made a video that I hope to add to this entry later. 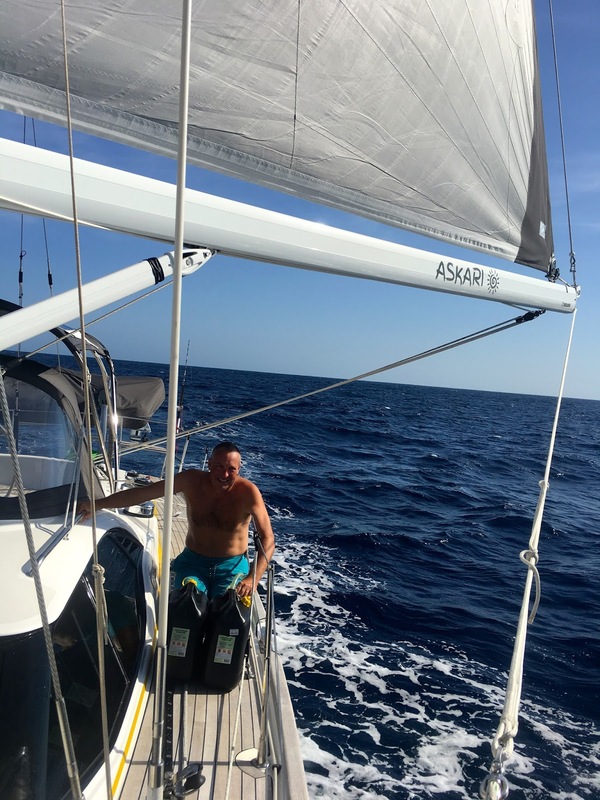 Yesterday afternoon we continued to sail very slowly wing on wing making only about 5 knots most of the day but it was nice so we just relaxed, read and enjoyed it. However, the wind eased over night to about 8 knots so we put the engine on with just the main sail; for stability. By keeping the revs low we have found we can use minimal fuel (about 2.5 litres an hour at 1700 rpm), whilst making about 5/6 knots in these conditions. Andrew set up the fishing gear yesterday afternoon as I declared that the fresh meat had been depleted enough to catch a fish - we are determined not to open the freezer just yet. So we have the gaff ready to go in one rod holder and our big tuna rod in the other. We also have a bright green baby bath tied on the aft deck to take any poor unfortunate fish we should land - to try and minimise fish on the teak deck!! Yuck…. but I have the wasabi and ginger ready and waiting!! I said yesterday that we had reached the tropics and the improvement in the weather is incredible. We are now mostly in bathers during the day and shorts and t-shirts at night - just brilliant. Interestingly right now we have superyachts all around us that we can see on the AIS - all heading to the Caribbean. Oh and excitingly Fenua just appeared again - 35 miles from us and we are in the lead - that's today's yay!! About 2,100 miles to go to Barbados!